Faceless Corporations. Neon lights that hide rampant crime underneath. The year is 2041. Cole Dorsett is a Script Kiddie, a thief of information with a chip against the system. 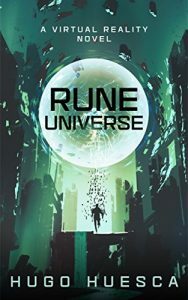 Rune Universe is a game with a billion worlds. With great interstellar alliances, unending adventure, spaceships that dance around black holes. And it hides a secret the CIA would love to crack. A secret many are willing to kill for. Inside Rune Universe, Cole will stumble upon real, mortal danger. To avenge a fallen friend, he must risk it all. And make a decision that will change the face of the world… forever.